Laura M. Clay, a member of the Mary L. Neal Auxiliary of the First Presbyterian Church in Bloomsburg, Pennsylvania, sent Martha Berry a $25 donation for the school. The money was left over from the Auxiliary's Missionary Society budget. Mary Freeman writes to Martha inquiring if the barrel of clothing that was sent had been received. 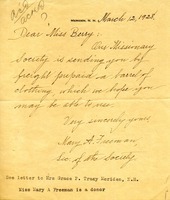 In this letter Miss Mary A Freeman states that her missionanary society will be sending a freight of prepaid clothing to the Berry Schools for the children there. 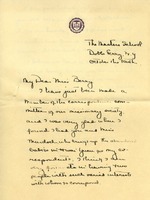 Letter to Martha Berry from Jane P. Myer concerning her interest in the Berry Schools. Mrs Myer informs Miss Berry that she used to be a resident of Augusta, Georgia and that she had often heard about the fine work done at the Berry schools. She also informed Miss Berry that she recently saw the account of the Berry Schools published in the N.Y. Tribune. Although she informs Miss Berry that she now has made her home near Boston that she is part of a Missionary Society that offers donations for those doing work in missions. She asks Miss Berry to inform her of anyway that they can help and that within their societies means they will help in whatever way they can. Donation of $10.00 from Ellen M. Lucas on behalf of the Fannie M. Newell Missionary Society.